Author: Tamene Bitima. Series edited by: Hans-Jürgen Sasse †. Afaan Oromo belongs to the Cushitic languages among the Afro-Asiatic languages. Other members of this group are Saho-Afar, Somali, Konso, Agaw, Hadiyya and Beja. Oromo is one of the most important languages of Africa, with more than 30 million speakers in Ethiopia, Kenya and Somalia as well as a further approximately 8 Million, who use Oromo as a vehicular or trade language. Thus, Oromo is counted as number four after Arabic, Swahili and Hausa. During 12 years the author has monitored the development of Afaan Oromo and collected the material of technical terms, specialty words and new developments for the present volume. The entries were drawn from all the relevant publications in Oromo published between 1840 and 1999. The result are over 20,000 entries from the natural and social sciences, grouped into 25 semantic fields. 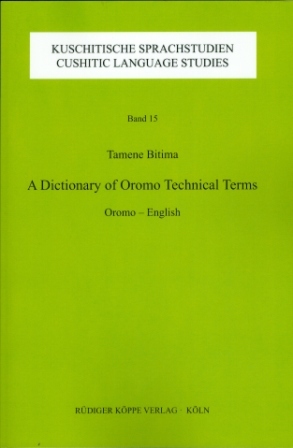 A further merit of this dictionary is the fact that it is the first one ever published in Oromo. The lexical entries are ordered alphabetically according to the orthography of the new official Oromo alphabet qubee. An introduction to the qubee and a phonemic table is provided, followed by a detailed bibliography of published works in Oromo and selected publications in European languages on Oromo. Numerous appendices listing the names of countries, their capitals and further urban settlements, geographical features (i.e. names of rivers, mountains etc.) and the names of the days of the week and the months close the book.